INDUSTRY.co.id - Jakarta - For parents working, the need to remain productive in the days leading up to and after Idul Fitri, often creates a dilemma for classical reasons, the children at home nobody keeps because the ordinary nanny keeps not back from going home in the hometown. Departure from these conditions, Indosat Ooredoo Management as submitted Group Head of HR Development Indosat Ooredoo, Arnold Wardiyanto, is very aware and empathetic to the existing conditions so that the idea to provide daycare facilities to support employee comfort in working, without worrying about the care the baby. 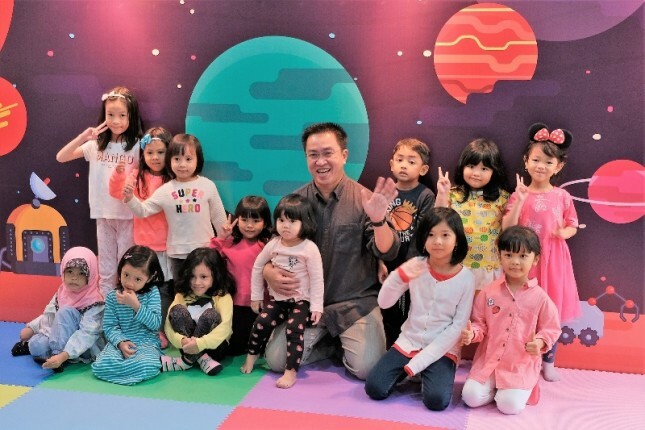 Daycare facilities made in the company's office is provided during the period before and after Lebaran, when the nanny has been going home or not back from Lebaran. Furthermore, Director & Chief Human Resources Officer of Indosat Ooredoo, Irsyad Sahroni added that "We understand the needs of employees during Idul Fitri, where they have to keep performing tasks that cannot be abandoned, and at the same time have to keep their children caregivers. For that we provide this daycare facility, so they can keep working quietly and children are kept not far from their parents. " This daycare facility is provided at Indosat Ooredoo headquarters divided into two batches ie batch 1 on 6-12 June 2018, and batch 2 on 20-26 June 2018 is for children aged 2-8 years. All employees located at Indosat Ooredoo head office have the opportunity to use day care that is opened at 08.00-17.00 WIB. Not only nurturing, this facility provides fun and educative activities for children, playground, study, sleeping zone, and healthy meals for children. Especially for children's food, the company provides morning snacks, lunch & afternoon snacks for employees' children deposited in daycare facilities. Educational aspects are packed very diverse, such as singing, dancing, various game tools, listening to stories, reading books, so that children not only happy but also can learn many new things. Children can also learn independently through eating activities, washing hands, changing clothes as one useful learning. Each completed at the end of the day, parents will get daily reports of activities and conditions as long as the child is in daycare facilities. The provision of daycare facilities is a manifestation of one of the company's values, namely CARE, where employees continue to provide the best contribution to the company in order to provide maximum service to customers, ahead of Idul Fitri. "We are aware of the possible sacrifices that the Indosat Ooredoo family may experience in its task of addressing the growing networking needs of Ramadan and Eid. For that reason this facility is realized, this is a form of company appreciation to employees because we believe, happy employees and engage will provide the best service and results for customers, "said Ershad Sahroni closed his explanation.